Valley View Baptist Church – Come worship with us! Come see what a BIG difference a small church can make! 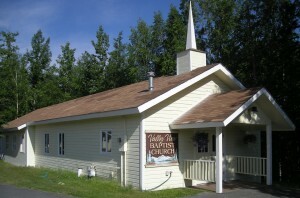 Valley View Baptist Church is a small family church in Eagle River, Alaska. We have a vibrant music program and a close-knit fellowship that always welcomes newcomers. About 75% of our membership is military or prior-military. We are affiliated with the Southern Baptist Convention. The Eagle River Korean Baptist Church also meets here on Sunday afternoons at 2:00 pm. Our two churches come together twice a year to hold joint celebration services on Easter and Christmas.